From the Silver professional saw blades to the Gold Premium TCT Saw blades for cutting wood, metal, plastic and aluminium Tradefix Direct supply them all at LOW trade prices. Coarse finish: These blades have between 16 and 20 teeth for smaller blades and 28 teeth for blades with a diameter greater than 190mm. Suitable for ripping through timbers such as softwood, hardwood and plywood. Medium finish: These blades have between 20 and 28 teeth for small blades and 40 teeth for blades with a diameter of 190mm. Suitable for cutting through timbers such as softwood, hardwood and plywood. Fine finish: These blades have between 40 and 80 teeth: 40 teeth for blades with a diameter of 190mm, 60 teeth for 210-260mm diameter and 80 teeth for blades with a larger diameter. Suitable for cutting through timbers such as softwood, hardwood particle board, MDF, single-sided wood laminates and hardboard and plywood. Extra Fine finish: These blades have between 60 and 100 teeth: 60 teeth for blades with a diameter of 190mm, 80 teeth for 210-260mm diameter and 100 teeth for blades with a larger diameter. Suitable for cutting through timbers such as softwood, hardwood particle board, MDF, single-sided wood laminates and hardboard and plywood. What are Thin Kerf Saw Blades? 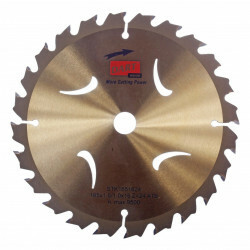 Thin Kerf Saw Blades are specifically designed for battery operated machines. These blades are thinner at the tooth resulting in much less strain on the blade therefore less loss of power on the battery, making them much more suited for cutting Softwood, Hardwood, Particle Board, MDF, Hardboard and Plywood. Sizes range from 120mm to 190mm in diameter. If you are using a cordless machine such as Dewalt, Makita or Milwaukee power tools then the blade you will need is a thin kerf saw blade which range from 120mm to 190mm diameter and 10mm to 30mm bore sizes. 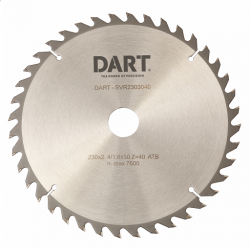 165mm x 20mm x 24T and 40T are by far the most common saw blades on the market. For corded machines the sizes range from 150mm to 216mm in diameter with either a 20mm or 30mm bore size. 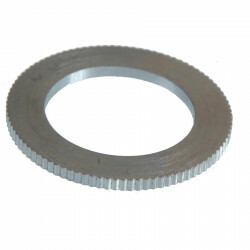 Reducing rings are available to reduce the bore size down from 30mm to 20mm. 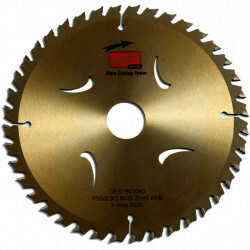 The most common saw blade in this range would be the 190mm x 30mm x 28T. For industrial machines the sizes range from 250mm to 500mm diameters. ATB Tooth - suitable for most applications including rip saws and table saws. ATB Neg Tooth - suitable for use on mitre saws and chop saws. Minimising scratching and pick up of material. TCG Tooth - suitable for materials such as aluminium, plastic, wood laminates, and other man-made materials. Leaves a chip free finish due to its bevelled corner tooth which cuts first follwed by a flat top tooth.